Cinema OCD: All the kids are doin' it. 12. Cries and Whispers (1972)I may have seen this movie. It's possible. I watched a lot of Bergman films in college film classes. I think being forced to watch Bergman films was an experience that came very close to putting me off watching foreign films for good. Most of the French New Wave had a similar effect on me. If it weren't for the saving influence of The Bicycle Thief, Jules Et Jim and La Strada, I probably would still want to run a mile every time I saw the Janus Films logo flash across the screen. 11. Bunny Lake is Missing (1965) I've started to watch this movie about half a dozen times but have never gotten much past the first half hour. On occasion I've been interrupted, but really this movie just fails my 20 minute test. If a film fails to engage my interest in the first 20 minutes and its not something I'm really committed to watching, I usually switch it off. I know it's supposed to be a great thriller and it has Lawrence Olivier in it, so I probably will eventually overcome my ambivalence about this movie and get past the slow beginning. 10. The Jazz Singer (1927) Everyone knows this was the first "talkie" but how many people have actually sat down and watched it? I'm not a big Al Jolson fan so apart from it's importance to film history, there isn't a lot here to inspire me. It may be a while on this one I'm afraid. If it helps, any, I did see the 1980 remake with Neil Diamond. I love that guy. 9. Key Largo (1948) Probably the most famous Bogart movie I haven't seen. Key Largo was directed by John Huston and co-starred Edward G. Robinson. Either of those things should be enough to recommend the movie to me. It's languished on my DVR for ages because there always seems to be something a little more interesting, new and exciting to watch instead. The Bertie Higgins song, of the same title, probably has more to do with why I've never seen the movie than anything else. 8. Now Voyager (1942) I'm only just getting into Bette Davis as is evidenced by my tendency to misspell her name. But still, you'd think I would have seen her most famous and successful film from her biggest decade. Luckily TCM is showing this movie a ton this fall as part of the Essentials. I'm sure I'll catch it eventually. 7. Bluebeard's Eigth Wife (1938) A Gary Cooper comedy from the late thirties and I haven't seen it. And it co-stars the always-excellent Claudette Colbert. It's not easily available, but it's not exactly super obscure either. If I had a nickle for every time I've been outbid on Ebay for the VHS of this movie, I'd probably have a buck by now. 6. Theodora Goes Wild (1936) They show this movie on TCM a couple times a year and I always miss it. I've heard the radio version of it and I've read the short story that it was based on. I love Irene Dunne. So why can't I get it together and watch this movie already? I don't know. I'll have to settle for Youtube in the meantime. 5. Heaven Can Wait (1943) There are two Ernest Lubitsch movies on this list and this is the more obscure of the two. You will probably be shocked, SHOCKED when you see what the second one is. 4. Mister Roberts (1955) I've seen the play this movie was based on, does that count? I used to study every day in the Thomas Heggen Room at the journalism school at the University of Minnesota, does that help? No? Well, I have no excuse to not have watched this other than it just hasn't happened. Look at the cast list: Henry Fonda, James Cagney, Jack Lemmon and William Powell in his final film performance. Oh and it gets worse! It was directed by John Ford. Ack. I'm so lame. 3. Top Hat (1935) Now here is a huge confession. Not only have I never seen Top Hat, I've never watched an Astaire/Rogers picture all the way through. Not Flying Down to Rio, not Shall we Dance? Nope. Nothing. The weird thing is I really love musicals. Maybe I'm just biased towards MGM musicals in color or need to have a Rogers and Hammerstein score attached before I can commit but really would it be so hard to watch Top Hat? No, just the opposite. It'd be all too easy. You see, deep down I'm terrified that I'll fall in love and have ANOTHER obsession to deal with. 2. Twentieth Century (1934) I've probably faked my way through conversations about this movie because it's just expected that anyone who supposedly knows something about comedies from this era, has seen it. It was directed by my favorite director, Howard Hawks, it has dialog by my favorite writers, Ben Hecht and Preston Sturges, and it stars Carole Lombard, one of the best comic actors of the era. What's wrong with me, people? I have no idea what's going on here, but I'm sure it's funny enough to lift me from the despair of any number of personal calamities. 1. 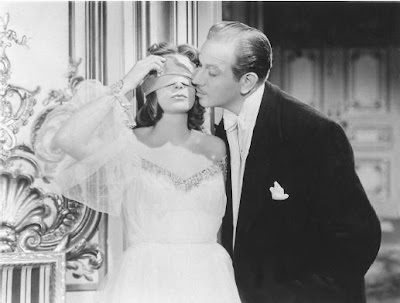 Ninotchka (1939) I've had this movie on my DVR for more than a month. In the past I've turned down at least two opportunities to watch it. I don't know what I watched in it's place, but it was probably no Ninotchka. I know it's a great movie and I know I should watch it. The only way I can explain this is something my friend AbbyNormal said about a certain Cary Grant movie she hasn't watched. "I know I should watch it, but I really like knowing there's one really good Cary Grant movie I haven't seen. I have it on my shelf waiting for me if I need it." So my not watching Ninotchka, is really like keeping a cinematic fire extinguisher at the ready--"in case of fire, break glass." In case my life should cut adrift in some way that requires the unique combination of Greta Garbo and comedy to restore it, I'll have it there waiting for me. I went to the Lazy Eye Theater website and still don't know what a "meme" is. Am I that old and don't know the hip lingo? I already know the answer. I'm having a difficult time coming up with 12 must see movies to talk about. Not that I've seen every great movie ever made by a longshot, but I've seen most of what I've had a burning desire to see. Most movies that I want to see now are obscure, forgotten ones. Like discovering all the pre-code movies of Barbara Stanwyck, Warren William and Kay Francis. I also like discovering indies that don't necessarily make it big. I'd be completely lost without TCM and the Independent Movie Channel. In lieu of naming 12 that I can't think of, I will offer a critique of your choices, Jen. Cries and Whispers - I've never seen it and actually passed up a couple of chances to buy it. I know, it's supposed to be a great flick, but Ingmar Bergman is just so darn depressing that I don't enjoy watching his movies. I've seen a few of his earlier ones and by jiminy he is one goot moovie maker, but not my cup of tea. Bunny Lake Is Missing - I'm not sure why this is on your top twelve to see, but okay. I saw the movie and it's not bad, and Olivier is superb, but if you never get time to see it, don't feel like your life isn't complete. The Jazz Singer - I suppose everyone who calls themselves a movie buff should watch this for historical purposes, but when it's all said and done, it aint a great movie. A true, historical achievement, but not a great film. Key Largo - I can't believe you haven't seen this one. TCM plays it fairly often and it is, if not a truly great movie, then a near great one. Bogie is perfect as the world weary ex-newsman, ex-soldier and Lauren Bacall was never sweeter than in this. Eddie Robinson as the heavy and Claire Trevor as his moll are pitch perfect in their parts. You just gotta see this one. Now Voyager - Everything you said about this one is true. Shame, shame for not having seen it. If TCM doesn't schedule it within the next three months, it's worth buying the DVD. Bluebeard's Eighth Wife - A very good romantic comedy. If you like director Ernst Lubitsch, actors Gary Cooper and Claudette Colbert and scripters Billy Wilder and Charles Bracket, then you should enjoy this movie. I have an extra copy of this which I will send you. Theodora Goes Wild - I love Melvyn Douglas and Irene Dunne in screwballs and this is considered Irene's first foray in that territory, so watch it as soon as it comes on again. Heaven Can Wait - The great Ernst Lubitsh did it again with this quiet, leisurely paced comedy, starring Don Ameche and Gene Tierney. A must-see. Mister Roberts - A wonderful service comedy. My favorite scene is when they make scotch. Top Hat - The Astaire/Rogers musicals are my very favorites. Yes, even more than the brilliant technicolor MGM vehicles. Fred and Ginger dance like nobody's business and fantastic Irving Berlin songs. I actually like The Gay Divorcee better, but Top Hat is a close second. I had to buy the complete Astaire/Rogers DVD collection, that's how much I like them. Twentieth Century - And you call yourself a movie buff! If Hawks is your favorite director and this was his first big comedy, then you must find a way to see this! Barrymore is absolutely deliciously devilish in his part and the supporting cast is outstanding. Indeed, what is wrong with you? I beg you to watch this movie. Ninotchka - Arguably Lubitch's, Garbo's and Douglas' best movie. An extremely funny concoction, one that gets better with each viewing. If I were you, I'd pick some other Lubitch movie to hold back and watch this one. I haven't seen most of these, but I guess that isn't surprising since I am so busy playing catch up on a ton of classic movies I have never seen. I have seen three on your list. I won't rehash them as kda0121 has done such a brill job, but here you go. I have seen "The Jazz Singer" - ugh. I have seen "Now, Voyager" and find that one a little odd at first, but definitely a wonderful movie. I have also seen "Key Largo" and really enjoyed it as well. Expect another package soon with "Key Largo" and "Now, Voyager". Silly girl - watch them when you get them. Meme is any behavior that's copied or imitated. It used to be a fancy pants criticism word, but it's somehow spread to the blogosphere. Yippy. That was my secret plan, all along. To get people to send me movies! Abby, I have Key Largo already on my DVR. But if you want to send me Now Voyager, I wouldn't object! By the way, I'm almost done with Shrewfest. I'll be getting posts up soon. OMG, I can't believe there are movies out there I've seen and you haven't. I'm feeling a little disturbed by this. Therefore a Rogers/Astaire filmfest is now a must. Yes, it'll be a new obsession, but I don't think most of the world (only we few, we proud) will recognize it as separate from your current ones, so it'll be okay. Also you will understand why I was so blown away by Kitty Foyle; it was the first time I'd ever seen Ginge not dance. Great gams AND she can act too! One of the most wonderful things about Rogers/Astaire films is that no one - NO ONE - ever tries to wax poetic about surreys and their fringe. A very good list. I'm embarrassed to admit that I haven't seen them yet either, but most of them are in my Netflix queue. My poor friend wants to know what you had to say about Porkins, by the way. Just found your blog (through a non-media interest we share). I once had a film festival with the following 12: Freaks (1932), Babes In Toyland (1934), A Midsummer Night's Dream (1935), Sherlock Holmes and the Spider Woman (1944), Samson and Delilah (1949), Baron of Arizona (1951), Mesa of Lost Women (1952), Carousel (1956), The Magic Sword (1962), The Trip (1967), The Lord of the Rings (1978) and Mad Max Beyond Thunderdome (1985). One actor, Angelo Rossitto, was in all of them! Thanks for admitting that you haven't seen some Classics, and the lack isn't b/c they are into readily available for home viewing.